Although we look forward to and appreciate the “Public Holidays” throughout the year as providing a good opportunity for family time, in the sense of ‘religious observance” we don’t celebrate any particular holiday. Great... a restrictive, separatist cult who dont engage with the local community outside their own circles. Just what we need. I believe these to be the people who have craftily obtained planning permission to build on their land, part of garden, on Welton Road, then sold it as building land ,now selling the property. Next thing we know the house will be demolished for building land too. Do you smell a rat!! ........and none of this from 'disaffected former members'. Just ordinary people with eyes, ears and brains. It really isn't rocket science! 2.3 The Plymouth Brethren (Exclusive Brethren) Christian Church does not guarantee the delivery of communications over the Internet, as these rely on third party service providers. Electronic communications are vulnerable to interception and The Plymouth Brethren (Exclusive Brethren) Christian Church does not guarantee the security of these communications or the security of the Website. The Plymouth Brethren (Exclusive Brethren) Christian Church does not warrant or represent that the Website will be free of viruses or defects in its operation or design. Evangelical Times is a Christian publishing company and charitable trust committed to the dissemination of biblical Christianity throughout the world, particularly through its hard copy and online English language newspapers. Biblical Christianity centres upon the glorious redeeming work of Jesus Christ, the Son of God and only mediator between God and man, as expounded by the doctrines of grace. True Christianity proclaims that the only way to God is through Jesus Christ. It is unique, distinct and different from all other religious systems, including unbiblical ecumenism and multifaith. Evangelical Times is committed, as a matter of primary importance, to disseminating this biblical gospel, both evangelistically for the salvation of non-Christians and didactically for the edification of Christian believers. Evangelical Times also aims to impart a biblical world view to enable Christians to live and witness effectively for Christ and to promote their compassionate action for all humankind in a fallen and suffering world. In all its activities, Evangelical Times’ objective is to support and not supplant the role of local gospel churches. The objects are to provide for the increase and improvement of christian knowledge and the spread of the gospel as exemplified in the writings and works of j n darby, f e raven, james taylor senior, james taylor junior, james harvey symington, john sTephen hales, bruce david hales and their successors as minister of the lord in the recovery including by providing for the purchase, printing, publication and distribution or sales of such writings and works either gratuitously or at such other price (including a price less than cost) as the trustees from time to time think fit subject to the trustees having a discretion to restrict distribution of publications designated by the trustees from time to time as "helpful ministry for the saints"
I wonder if the Evangelical Times would aggressively pursue an elderly pensioner for publishing excerpts of their publications? Just asking, for the sake of the young, about the following statement. The Services and Confidentiality Deed bound McCorkell not to divulge any information "relating to the past, present or future operations or affairs" of the Exclusive Brethren church, its members "including Mr Bruce Hales", their family members, companies, trusts or employees. I thought each Gospel Trust was autonomous? So exactly what and who are 'Exclusive Brethren church' members? The B and GT's insistence that it owns copyright of verbal contributions of PBCC members during meetings that it then publishes, could open a huge can of worms. EB history is littered with ex-trustees of the B and GT who apparently took it upon themselves to change what was actually said. Are the B and GT not now targets for legal actions by those members whose words were changed without their express permission? In my opinion, the dismissal of B and GT trustees for 'changing ministry' was just a handy excuse to get rid of them by the next regime anyway. Were the trustees really that stupid that they could never learn from the lessons of their predecessors? We used to be told that the Devil had the same old bag of tricks! NEW YORK, Jan. 28, 2019 /PRNewswire/ -- Despite the end of the government shutdown, the Rapid Relief Team (RRT) will continue a national campaign to provide free meals to Federal Transport Security Administration (TSA) employees right across the United States. 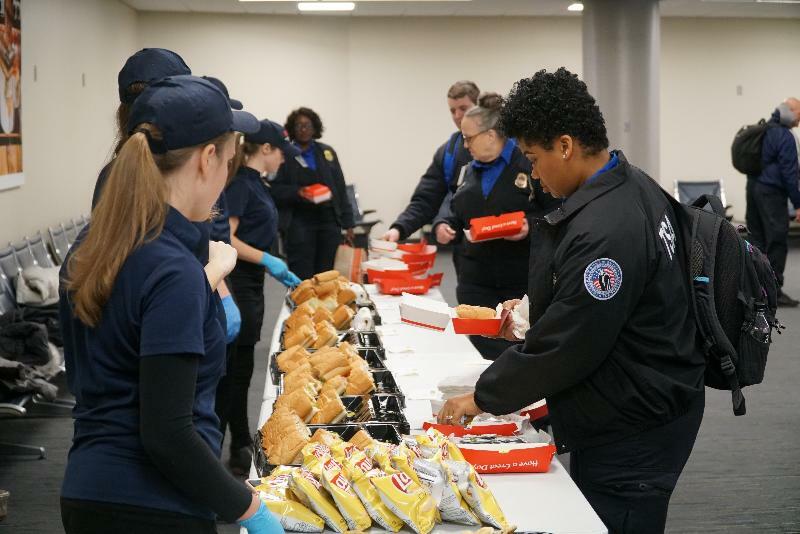 While workers wait for their paychecks to arrive, the RRT continues to provide thousands of hot meals to TSA employees at more than twenty-five major airports across the country. More than 4,000 free meals in total will be served by RRT volunteers over the course of the next week at major airports including LAX, New York, Chicago, Philadelphia, San Francisco, Washington, Indianapolis, Newark, San Antonio, Seattle, Columbus, Knoxville, Omaha, North Dakota, Baltimore, Minneapolis, Oakland, Des Moines, Detroit, Pembina, Council Bluffs, Westfield, Manchester, Omaha, Redwood Falls, Kalispell, Portland, Rochester, and Cleveland. Earl Gracey from the Plymouth Brethren Christian Church said the RRT is always looking for opportunities to support to those in need. "First and foremost, we are Christians, and lending a helping hand to those in need is at the core of what we do," he said. "The meals are a modest gesture to show our support for those who are working without pay - at least they don't have to worry about lunch. "The news of the government shutdown ending was a welcome relief - however, it is our understanding it could be up to a week before these workers will receive their pay. "So, the RRT will continue to serve these workers - and we genuinely hope the meals we serve will help ease the burden in the smallest way. If you are in the USA and working at an airport the PBCC don't use or live near............you can starve! The B&GT's dogged pursual of Ian Mackay tells a different story. One that any genuine Christians would want to distance themselves from. Not only does this website expose the inherent problem with the PBCC, the issue of personal choice, it also exposes the fact that each individual assembly is not 'autonomous' as they constantly claim, but is forced to adhere to the whims and wishes of one, un-elected and supposedly unimpeachable leader. What happened to the rented Wordex. eh? Every time these people do anything or say anything, they confirm to the other 99.99999% of the world population what Bloody Hypocrites they are. Ask yourself, why do the PBCC bother telling us how wonderful they all are, when they have little or no interest in recruiting new members, nor sticking to commitments made to the Charity Commission that they wouldn't treat ex-members any differently than anyone else? As we speak, an elderly Scotsman is being aggressively pursued in the courts by the PBCC owned charity Bible and Gospel Trust.